A report on Friday claims Apple recently signed the lease on a nearly 300,000-square-foot office and R&D complex in San Jose, Calif., as part of plans to expand into areas surrounding its home base in Cupertino. 101 Tech campus in San Jose, Calif. Citing multiple sources familiar with the matter, the Silicon Valley Business Journal reports Apple will take over the 101 Tech campus at 2325 Orchard Parkway, an almost 300,000-square-foot multi-use space with room for research and development, offices and more. 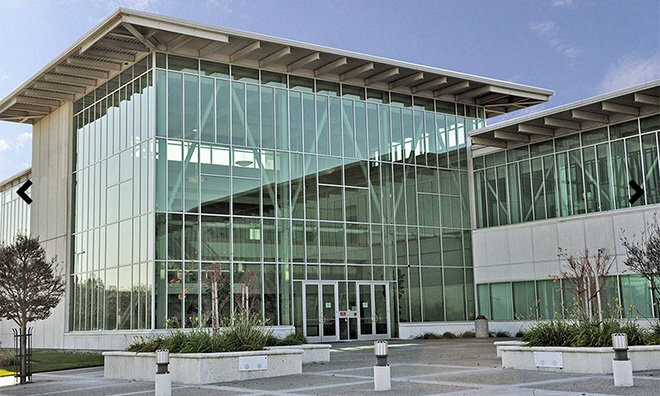 Purchased by developer Ellis Partners in 2011 and renovated 2012, the 101 Tech campus used to serve as the corporate headquarters of semiconductor manufacturer Atmel Corp. Ellis' renovation created sunlit open workspaces and major alterations to outdoor amenities, the report said. As building permits have yet to be filed, it remains unclear as to what Apple intends to do with the site. Apple, which already inhabits a relatively small office next to the headquarters of Hewlett-Packard spinoff Agilent, was rumored in May to be looking for up to 1.5 million square feet of office space in San Jose. At the time, 101 Tech was on the shortlist of potential candidate sites, another being mixed-use development Coleman Highline. With booming product sales and record revenues, Apple is quickly outgrowing its current infrastructure. The company is in the midst of constructing a gigantic 2.8-million-square-foot flagship campus in Cupertino, temporarily dubbed Campus 2, designed to house 13,000 employees. Campus 2 is slated for completion in summer 2016 at the earliest, but those estimates might be optimistic given Apple recently dumped two contractors from the project. As a more immediate solution, the company has been buying up commercial real estate in Cupertino, Sunnyvale and Santa Clara.